Java programming assignment help. Good old Java is one the most widely used programming languages but that doesn’t mean that all of its areas are well-explored and easy to cope with. Sometimes it’s just impossible to memorize all the classes and figure out how to incorporate them. We are here to do just that. C programming assignment help. How about all of those functions – confusing, isn’t it? You can easily get lost in all the numbers and characters and simply not see what stops your code from working. Our team will be able to detect the bug and fix it in no time. C++ programming assignment help. Struggling to put the code together and can’t concentrate on the big picture? Let us help you out! Provide us with all your ideas, coding drafts and together we’ll be able to create a perfectly functional code! I t doesn’t matter what programming assignment you need to do whether it is in C++, Java, Perl, Adobe Flash, or Visual Basic among others, we are confident that our programmers can complete your homework on time. 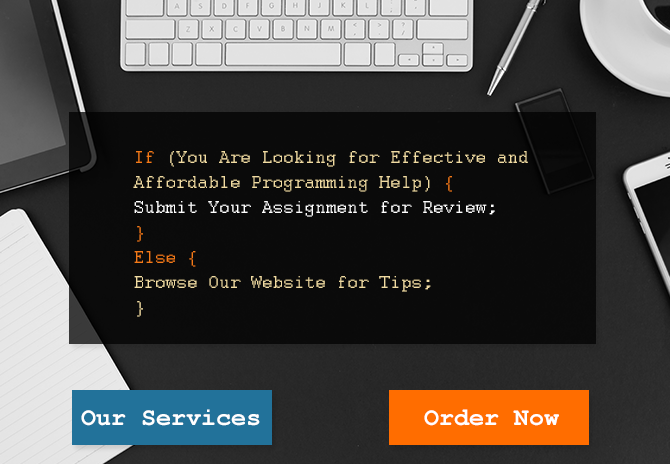 Our programming homework help service team has several professional programmers who have the skills as well as experience in handling various programming homework where you can even discuss details of your order so you can get the best result. It is understandable that you’ll feel frustrated with your programming homework especially when you have other subjects to consider. Instead of spending most of your time writing code and debugging it, having expert programmers handle your work is worth it especially when you get to see the results. And since you’ll be working with our programming homework help service for your programming expert assignment, relying on the skills of veteran programmers will certainly go a long way. Programming homework help from experienced writers. Don’t hesitate to ask us for help now!